Eons ago, when BMW decided to offer a revolutionary new helmet—the modular or “flip-up”—it partnered with another German company to design and produce it. It turns out that Schuberth has been around about as long as BMW and was already well-established in the business of protecting heads from impact in motor sports and industry. BMW doesn’t sell helmets in the USA anymore, but that doesn’t matter because Schuberth does. So you can still have the design, engineering, comfort and quality associated with the BMW brand. The first impression, of course, is what it looks like. Yes, this sleek silver helmet looks good, but it was only when I happened to set it on my desk, next to my laptop computer while writing this review, that I realized why. The C3 PRO has the same clean, elegant, uncluttered contours as my silver Apple MacBook Pro. The reason for that may have as much to do with engineering as with design, since the helmet was developed using a wind tunnel. Good aerodynamics looks good, too. When I first lifted the C3 PRO and tugged on the chinstraps, opening the base of the helmet and sliding it down onto my head, I experienced something akin to sinking into an expensive leather sofa. The thousands of tactile sensors on my head, ears, cheeks and neck signaled approval. It was not only a good fit, the essential feature of a motorcycle helmet, it felt good, and that’s all the difference in the world. Look inside the helmet at liner design and the plush materials they’ve chosen, and it’s clear why it feels luxurious. Female riders will be glad to know that Schuberth also offers a separate series for women, with a lining adapted to the female face and special contours in the cheek pads. The next striking impression was on the freeway as my speed climbed upwards of 75 mph: this is the quietest helmet I have come across – ever. There are lots of good helmets out there, quiet too, but not this quiet. The wind noise was least when I stood up on the pegs, bringing my head out of the windshield-induced turbulent zone into “clean” air. Best performance in a sitting position would likely be achieved by trimming 2-4 inches off my Triumph Tiger’s stock fairing to bring the turbulent zone below the bottom of the helmet. The C3 PRO was released in January of this year and offers improvements to the prior model in several areas. A spoiler, not tacked on but molded as a part of the hard shell, has been added to reduce uplift and improve stability at higher speeds (looks cool, too), there is better ventilation with the top- and chin-bar air intakes, and an upgrade in comfort via the helmet liner system. There are lots of little touches like the molded ridges at the upper edge of the visor (to eliminate any whistling noises), and the removable insert on the chin bar’s wind cuff (winter in, summer out). The drop-down internal sunshade is continuously adjustable, a nice feature that makes it possible during a certain time of day to shade your eyes yet not look directly through the sunshade. The optical quality of both the face shield and the sun visor is excellent. When you consider the DOT-labeled beanies, more like yarmulkes with chin straps, sometimes worn by our Harley brethren, you might think those bureaucratic stickers don’t mean beans. Actually, they do, and DOT 218 isn’t the only certification that Schuberth obtains. There’s a European one, the ECE. To obtain the latter, Schuberth has to take 150 helmets out of every 3000 produced (5 percent off the top) and subject them to destructive testing for various types of impact. This is more than meeting a standard—it’s a brutal and expensive form of quality control. 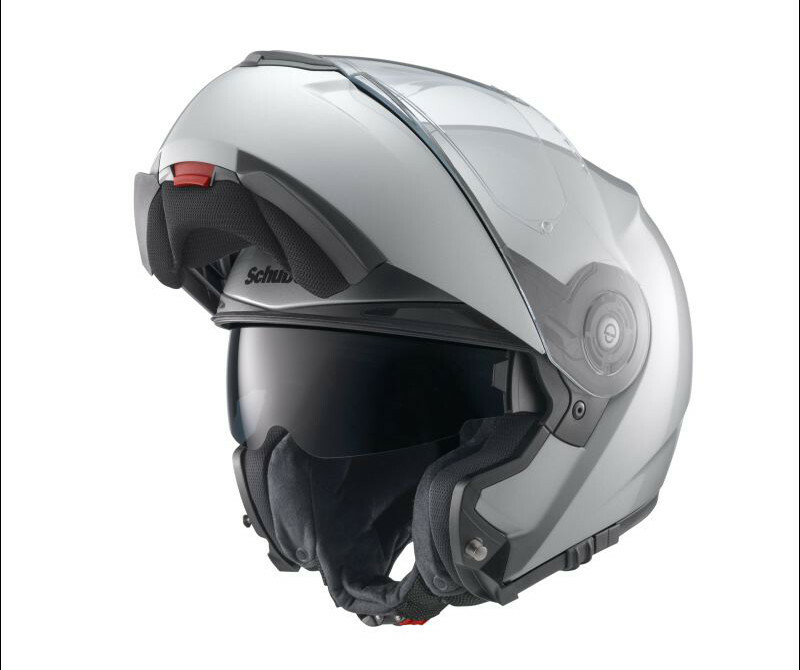 Add the Schuberth Rider Communication system and you don’t just wear your C3 PRO, you are entertained and informed by it as you listen to music or talk on your smartphone while cruising the diamond lane on your way to work. Schuberth, not a communications company, has followed the example of BMW and found a partner with that experience—Cardo systems—to manufacture the SRC system. The guts of the SRC are contained in the helmet’s neck collar. Thus, there’s nothing to bolt on or glue in place when adding the SRC system. The speakers attach with Velcro fasteners to the expanded polystyrene (EPS) inner shell and the microphone protrudes from the right side of the neck collar, opposite where the operational buttons (five in number) are located. But the real genius of this installation is that the SRC attaches via a small connector to an antenna, pre-installed in the helmet between the hard shell and the EPS. There are actually two antennae, a small one for Bluetooth and a long one (31 inches) for FM radio. Any ham radio operator will tell you that an antenna becomes efficient when its length increases to about half the wavelength of the radiation to be received. In the FM radio spectrum, that’s about 30 inches, and is the reason Schuberth put an antenna in the helmet and not in the neck collar. This makes an enormous difference for reception and, in fact, I now enjoy listening to FM (toggling through six preset stations) while riding. Having the Bluetooth antenna on top of the helmet rather than lower around the neck also helps, but the improvement is not as dramatic as with FM since the Bluetooth frequencies have a much shorter half-wavelength, about 2.5 inches. Rider-to-rider communications (with a passenger or another motorcycle) and FM are “stand alone” in that only one or two SRC units are needed. But the real power of this whole technology comes in coupling the SRC to something else, namely, a smart phone. (Readers who have already been doing this for years will forgive my newbie exuberance when they learn that I got my first smart phone, an iPhone 5, only months ago.) So now I have it all, the ability to answer or initiate a phone call, accept voice guidance from a GPS, and listen to my favorite mov’n-on-down-the-road music the rest of the time. The speakers put out really high-quality sound (I used the included extra Velcro spacers to push the speakers closer to my ear for better audio coupling) that is spectacular at low speeds with low wind noise, and still remarkably good at 75 mph at maximum volume, able to punch through even my custom-molded earplugs. Yes, it’s amazing, but it’s not trivial. Remember those five buttons? Well, you’ve got to remember which ones to push in which combinations to access one of the many possible operations. (Hint: take along the compact Quick-Start guide, or better yet, you can keep the PDF on your smartphone) Moreover, you’ve got to know which button your gloved finger is about to press. The buttons are small, about the size of the ones on your shirt, or the tip of your finger. The tactile expertise to manage this with gloves on can be acquired, but there is a definite learning curve. My only suggestion to Schuberth for improvinmg their SRC system would be to make the buttons at least dime-sized, if nickel-sized isn’t possible. 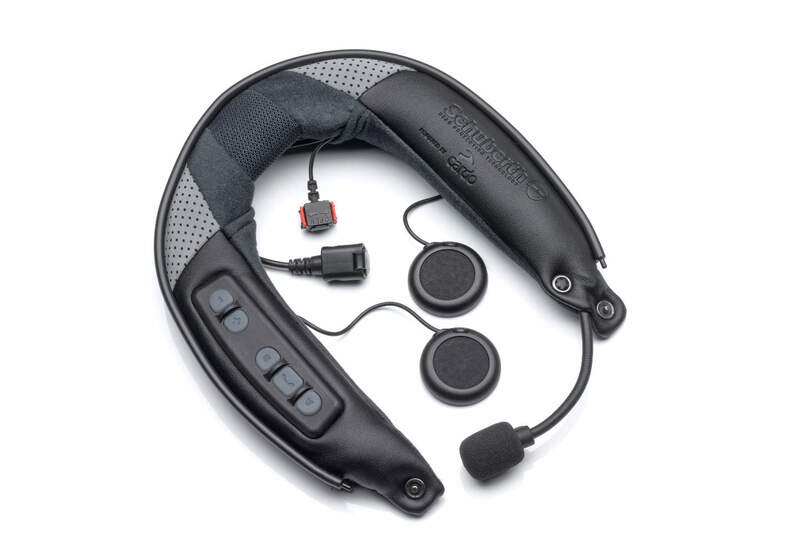 A big advantage of having Cardo produce its communications system is that the Schuberth SRC is compatible with practically any other Cardo system headset. Thus, you are not locked into buying another Schuberth SRC to talk to your passenger, but could use an existing set for that. That’s exactly what I did in order to road test the SRC. I paired it with an older, Cardo Scala Q2 headset. With that, the bike-to-bike communications worked fine as long as we had line-of-sight and the distance was (very roughly) 0.2 mile or about 1000 feet or less. In this test we were surely limited by the capability of the older Scala headset. 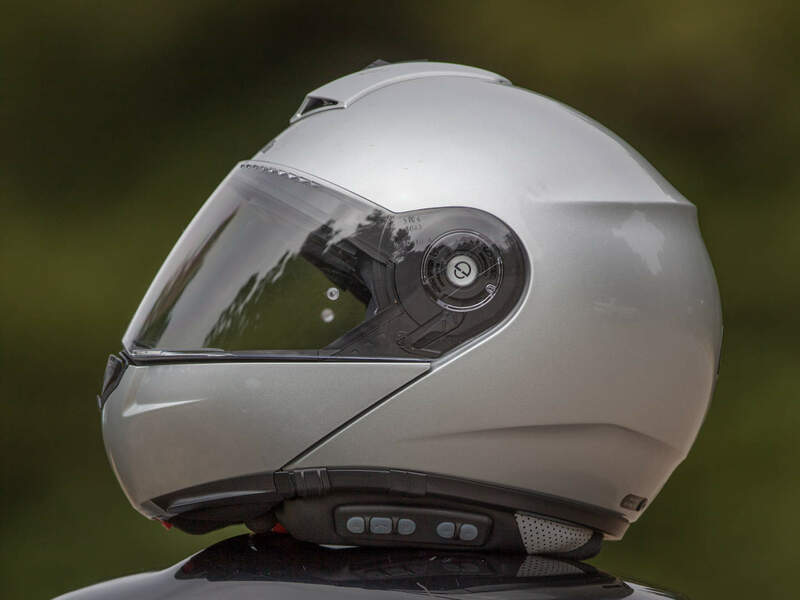 Schuberth reports distances up to 2300 feet, but I assume that is for two equivalent SRC systems, each connected to a helmet antenna. All this is wonderful, but is not (as you correctly surmised) exactly cheap. The MSRPs are $769 for the C3 PRO helmet and $429 for the SRC communications system. That’s $1200 plus tax and I will spare you a list of other motorcycling goodies you could also get if the price were half that. 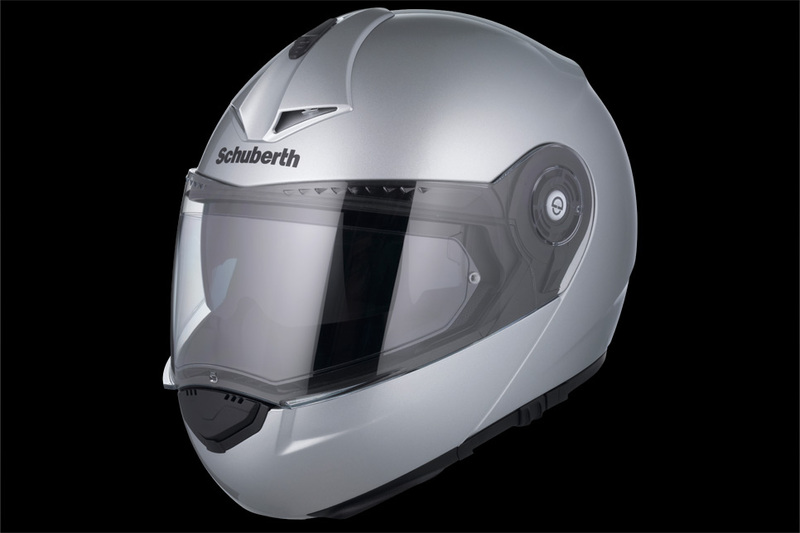 But for those who want and can afford the very best – and I hope you’re fortunate enough to be in that group – I heartily recommend this Schuberth combination. BMW dealerships usually carry Schuberth helmets, but there are other dealers as well. Visit www.schuberthnorthamerica.com to locate the dealer nearest you and to learn more about the company and product development behind this remarkable helmet. It’s about bliss, not bling. For me anyway. When it comes to helmets for me personally, comfort has a tremendous amount of value since it makes riding that much more pleasurable. My current helmet costs about $500, and I can’t imagine finding one that fits better. However, I wouldn’t hesitate to spend twice that amount that if I felt confident another helmet could offer even a modest increase in comfort. I think the biggest problem with helmets is that you don’t really know how one fits you unless you go on a two-hour ride with one on your head which makes premium helmets like these a risky purchase for buyers new to a brand or even an individual product line. I wasted a lot of money on helmets over the years trying to find that Goldilocks fit before finding a helmet that really works for me. You make a great point. I have bought helmets that felt >okay< at the dealership, then turned into torture on the road after a few hours. I think a small nuisance can turn into a nightmare after a few hours. Always try the helmet on and take this into consideration. At 4 lbs 1 1/4 ounces, this helmet is among the heaviest on the market…which isn’t good in a crash. That’s plenty of weight for our spindly, unsupported necks to handle in a crash. Further, ECE tests have shown that flip-up helmets can be less safe in crash due to the failure of the hinge system used. Which is why these helmets are illegal for racing. If protection is what you’re looking for (and most should be looking for this) you can do much better than this helmet for less money and have cash left over for additional safety gear like a back protector. Flip-up helmets have long passed ECE (and DOT) tests. If a helmet fails during testing, I hardly imagine them passing it! You can’t use many flip-up helmets for racing because they have not been submitted for SNELL approval – except LS2, who makes a SNELL approved helmet. I haven’t seen any tests or reports from safety agencies that suggest flip-up helmets are unsafe. They use the same style of strap so it stays on your head, the main body of the helmet is constructed in the same manner and materials, and any impact to the face would tend to keep the chin bar from opening (I imagine). Besides, in that manner they are much safer than an open face helmet as it will save your chin and nose from being ground down – just as much as a helmet with an integral chin bar. I think you’re really just keeping the rumor mill turning. I always end up with Nolan helmets. You can get all that the Schuberth offers but in a much less expensive, high quality Italian version – and it is arguably quieter. Not racing legal. Therefore not really safe. Buy a full face without all the gimmicks. Unless you ride a Harley. Then it’s better to look good and feel good than to be good. Obviously you have no experience with these helmets. They are extremely safe and are purpose built for touring and sport touring. There are no gimmicks, just form following function. The Harley comment demonstrated your compete lack of understanding of the design of these helmets. I’ve never seen a Harley rider with one, but i have seem countless BMW riders and other long distance riders wearing them. You’ll also find them all over Europe, where riders are serious about their riding. Maybe it isn’t as safe during a 180 mph mishap as a “racing legal” helmet, but it will do perfectly fine in just about every other situation. Plus what makes a racing legal helmet work better at 180 mph may make it worse for your noggin at 60 mph. About 5 years ago I replaced an aging Shoei RF series helmet with a Schuberth R1 (this is a standard non-flip version that still includes the internal sun shade). Actually I got two and also replaced my wife’s helmet. The helmets are light, quiet, and super comfortable. We have both been super happy with them and they are our favorite helmets to date. The only downside was that I had to import them direct from Germany (about $300 each with shipping) as no one was selling them in the US at the time. It looks like actual street price on the C3 Pro is around $650 with the SRC coming in around $350. This is still a bit expensive, but given our past Schuberth experience, I would definitely put it on my short list of helmets to consider. Needs editing. Not enough superlatives for this mostest bestest helmet. That may be, but the fact is, everyone I know who has bought the Schuberth say the same things. I have owned a wide variety of high end helmets including the original C3 , Arai Rx7, Corsair,RXQ and now C3 pro. THe Schubreth’s are buy far the quietest helmets on the market the C3 pro being significantly better than the C3 .The Arai’s are also great helmets but have fallen behind Schubreth in a number of key areas. As far as quality is comcerned I have had no issues with either Schubreth ,my new RXQ had a loud whistling noise and ill fitting shield mechanism. THe noise was corrected by repalcing the top air vents,the shield is still not right.Nobody is perfect. Slickest Bluetooth solution currently available. I just wish it was more affordable. I’m immediately reminded of the teen busy texting veering into the oncoming lane with fatal consequences. Nice helmet, but with the distraction of telephone calls, selecting FM radio stations and otherwise fiddling with the buttons aboard a motorcycle seems to me somehow not smart. Goof point. Those of us that ride don’t need the extra distractions while riding. I’d rather just enjoy the ride and leave the techojunk to those that need more stimulus while riding. It looks heavy. How much does it weigh? The weight of the base C3 is 3 lbs, 8-1/2 oz. Pretty average for helmets, modular or not. I’ve always liked flip front helmets. I owned both of the early BMW flip fronts, first was very noisy, second better,maybe they’ve figured out the noise after 2 1/2 decades. I think the price will keep this one off my head. I need to get a trackday costume together and this isn’t welcome on many/any tracks. Nice looking helmet for sure but at that price it will have limited appeal. And like the Macbook Pro and iPhone 5, there are other things than surface beauty that matter and great protection is available elsewhere for half the price. Add too that we should be swapping out our helmet after so many years of wear and tear and this becomes a pretty tough pill to swallow for most. My guess is this will appeal to the relatively few who would spend this on a helmet and also like to flash some bling. So basically, you posted this just to tell everyone you have a Macbook Pro and an iPhone5, right? You missed the point, right? I hope it’s better that the Schuberth I have. It developed a crack just above the shield, about an inch long, for no apparent reason. It was never dropped. I don’t recall ever noticing a large object hit it. I just took it out of the cabinet one day and it was cracked. The shield had a layer of some laminate that peeled off for no apparent reason. Finally, the interior deteriorated faster than any helmet I’ve ever had. I’ll never own another one. For the same money you can buy an Arai or Shoei, or any number off less expensive helmets of better quality. I’ve owned many Shoei helmets over the last 35+ years and have never had a issue with ANY of them. I don’t think I’m going to change brand loyalty any time soon. Also, whether a helmet is quieter is very subjective as a person’s head shape and fitment inside the helmet. Also, no matter how good a helmet is, $1200 plus tax seems a bit over the top.